Do Both Parties Have the Wrong Answers to the Economy? Lawrence Summers and Timothy Geithner are back in America's good graces again, which is a shame because they helped to create the mess. The only one missing from this circle of redemption is Robert Rubin, who after playing a key role in causing the present economic crisis proceeded to screw up Citigroup as special counsel to that very entity which had inspired the law that made this entire crisis possible. In Rubin's case there are not many people who can claim on their resume to have brought the American economy to the brink of the worst depression in seventy years and then move on to take down what was once the world's largest financial institution. His proteges Summers and Geithner somehow emerged from this fiasco even stronger than before, living personifications of what should be termed the Rubin Principle which says the more you screw up the higher the government position they appoint you to. 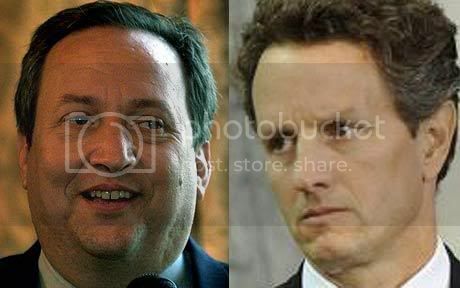 Geithner and Summers along with Rubin are why this financial crisis will not be satisfactorily resolved, for in order to take the necessary steps to alleviate it all would have to admit their part in causing it and even more pointedly admit that their boss at the time, William Jefferson Clinton, also played a role. It short it would mean that instead of tying this albatross solely around the neck of George W. Bush and the Republican Party they would have top admit that at its root this crisis was a bipartisan affair. However, if one parceled out blame the way they do in auto accidents, the GOP would bear the majority of it for they supplied the Congressional majority--and even put their names on the bill that caused this mess, the Gramm-Leach Bliley Act. But Rubin and his two sidekicks convinced Bill Clinton that the bill would be a good idea. So on Rubin's advice, Clinton looked the other way while Citi put its considerable lobbying forces into motion to make Gramm-Leach-Bliley possible, which is why one of the pens Bill Clinton used to sign the bill hangs in a prominent place in the office of former Citi CEO Sandy Weill--the man who created what was once America's largest financial institution out of a loan-sharking business. Both Geithner and Summers played a role in this fiasco. Summers was the more prominent for he served as Rubin's assistant Treasury Secretary before succeeding his mentor, who for his role in making Citi's mergers legal received a cushy job at Citi as his reward. Geithner at the time was serving as Under Secretary of the Treasury for International Affairs under both Rubin and Summers. Several commentators have noted the closeness of the three. Where Rubin's fortunes fell as Citi plunged into one of the greatest bubble implosions in economic history, one that rivals the collapse of the East India Company or the Tulip Bulb fiasco, Summers and Geithner were fortunate to remain some distance from ground zero. Summers was chased from the Presidency of Harvard only to reemerge as one of Barack Obama's chief economic advisors. Geithner became head of the New York federal reserve where his chief accomplishment was to sign off on the Bush Administration's bailout plan, a plan that was supposed to rescue companies at the center of this mess--one of which was Citi. The action the Three Mess-quiteers took was the repeal of the Glass-Steagall Banking Act. Named for a pint-sized, feisty Virginian who had cheered William Jennings Bryan's Cross of Gold speech as a delegate to the famous 1896 Democratic Convention, Carter Glass had Bryan's suspicion of banks, especially eastern ones. Bryan especially detested New York financier J.P. Morgan, whose name became attached to a resolution at the 1912 Democratic Convention condemning Morgan and fellow financiers August Belmont and Thomas Ryan, thereby helping Woodrow Wilson to upset Champ Clark and win the nomination. Glass would help create the Federal Reserve and then become Wilson's Treasury Secretary. The Glass-Steagall Act, as it became known, was one of the most important pieces of economic legislation in American history. Essentially it prohibited banks from entering into the securities market, which glass felt was one of the root causes of the Great Depression. Sixty years later this history was ruled irrelevant for the "new economy" of the 1990s as Rubin openly campaigned for the repeal of Glass-Steagall. If Glass-Steagall was one of America's greatest pieces of economic legislation, the bill which repealed it--Gramm-Leach-Bliley--is surely one of the worst. Besides allowing banks to engage it what became known as securitization it included a little-known clause providing an exemption from federal regulation for what were known as Industrial Loan Corporations. The results of GLB can best be glimpsed by the wave of concentration that gripped the American financial industry with the coming of the new millennium. What is still not generally understood about GLB is that it not only allowed banks to play with the likes of derivatives and subprime mortgages, it spurred the economic concentration and interlocking institutions that lie at the center of this crisis. The growth of subprime lending in the past decade has been quite dramatic. Using data reported by the magazine Inside Lending, Table 3 reports that total subprime originations (loans) have grown from $65 billion in 1995 to $332 billion in 2003. The structure of the market also changed dramatically through the 1990s and early 2000s...For example, the market share of the top 25 firms making subprime loans grew from 39.3 percent in 1995 to over 90 percent in 2003. Many firms that started the subprime industry either have failed or were purchased by larger institutions. The presence of Geithner and Summers in the administration of Barack Obama merely testifies that as long as they have the President's ear, the roots of this crisis--and hence its long term resolution--will be ignored, for to do otherwise would be to admit they helped to cause it. Yet we also should remember had Barack Obama not won in November, waiting in the wings was the man whose name is on the bill that repealed Glass-Steagall--Phil Gramm. It is not history that holds Summers, Geithner and America hostage; it is their ideas. From a historical point of view both men are actually fortunate in that unlike their mentor Rubin, they absented themselves from making economic policy at precisely the time the economic policies they had advocated while in the Clinton Administration were bankrupting the country. Rubin landed at Citi where he continued to advocate many of the ideas that had driven Clinton Administration economic policy. As Citi sank, Rubin insisted it was on firm ground even as he slipped further into the mire. Summers stayed largely out of the public eye other than his embarrassing remarks about women while he served as President of Harvard, but his well-connected friends extricated him from a situation that would have ruined other careers. Geithner carried water for the Bush Administration in his position at the New York Federal Reserve. If Geithner and Summers had little direct impact on policy during the Bush years, their speeches and articles written during that time hold important clues to understanding what they might have in store for America. Surprisingly in the love-fest that followed the inauguration of Barack Obama, the opposition never quoted from these works. As we all know, Timothy Geithner headed the New York Federal Reserve during the Bush Administration. That he should hold what is regarded as perhaps the key Federal Reserve position other than Chair under a Republican Administration should tell us a great deal about his economic philosophy. The Bush Administration would not have placed an orthodox Democrat in such a sensitive post. A key speech by Geithner delivered as Barack Obama fought Hillary Clinton for the Democratic Presidential nomination is instructive. In the speech, Geithner recites the history of the Federal Reserve System and America's financial regulation. It is extremely significant he makes no mention of the Glass-Steagall Act. Over the past 30 years, we have moved from a bank-dominated financial system to a system in which credit is increasingly extended, securitized and actively traded in a combination of centralized and decentralized markets. In many ways, the business models of banks and non-bank financial institutions—especially large securities firms—have converged, with banks playing a greater agency role in the credit process, and securities firms doing more of the financing. Describing the rescue of Bear Stearns, Geithner makes clear he was a key part of the Bush team. At 5:00 a.m., we participated in a conference call with our colleagues at the Board of Governors and the Treasury to review the options and decide on the way forward. After careful deliberation, together we decided on a course of action that would at least buy some time to explore options to mitigate the foreseeable damage to the financial system. We recognized, of course, that the use of this legal authority was, in itself, an extraordinary step... It seemed irresponsible for us not to use that authority in this unique situation. Nowhere in this recital of events does Geithner mention anything about restricting executive bonuses or placing any other constraints on the ability of Bear Stearns and others in how they used the bailout funds. We need to ensure there is a stronger set of shock absorbers, in terms of capital and liquidity, in those institutions, banks and a limited number of the largest investment banks, that are critical to market functioning and economic health, with a stronger form of consolidated supervision over those institutions. Nowhere in his speech does Geithner advocate that in return for providing this stability, financial institutions need to agree to new rules. Interestingly when Congress approved Glass-Steagall it created the FDIC, which provided government protection of bank deposits, but in return banks had to accept increased regulation of their activities. Geithner obviously does not think like Carter Glass. A credit crunch in an effort to control inflation seems compelling to me. In September 2000 he gave a speech that invoked the "knowledge economy" ideas that were then in vogue just at the time that founder of the Internet Al Gore was running for President. The new economy is often declared; seldom defined. But if there is one fundamental change at its heart it must be the move from an economy based on the production of physical goods to an economy based on the production and application of knowledge. Consistent with the guiding principles of the Project, Hamilton stood for sound fiscal policy, believed that broad-based opportunity for advancement would drive American economic growth, and recognized that “prudent aids and encouragements on the part of government" are necessary to enhance and guide market forces. can result in large job losses for low-skilled workers. Economic downturns historically come in two categories. For most of the post war period, economic expansions did not die of old age. They were murdered by the Federal Reserve in the name of fighting inflation. This was the story in 1958, 1971, 1974 and 1982 as sharp increases in credit costs drove the economy into downturns. Before World War II, and in recent years as inflation has come under control, expansions have ended as a consequence of the workings of the financial system, sometimes in conjunction with oil shocks. But an alternative source of recession comes from the spontaneous correction of financial excesses: the bursting of bubbles, de-leveraging in the financial sector, declining asset values, reduced demand, and reduced employment. Note the injection of "financial excesses" and "bursting bubbles." Have Summers' views of such a basic economic issue as the causes of recessions changed that radically in a year? Is Summers saying what he thinks people want to hear or is there some underlying philosophy that might explain the differences? Geithner, Summers and Rubin ultimately were part of a fascinating convergence that took place at the end of the last century. For the first time since Grover Cleveland's Democrats and William McKinley's Republicans agreed on economic fundamentals, in the 1980s and 90s, the two parties occupied the same economic common ground. Gramm-Leach Bliley is not the result of some conspiracy or even a bald-faced attempt by Wall Street to buy off Congress and the Executive branch--although record amounts of lobbying funds were spent to be sure it passed. In the end GLB is about the power of shared ideas, an economic orthodoxy that made the likes of Rubin, Summers and Geithner indistinguishable from their Republican counterparts. While there were nuances to each, with the Democrats more inclined to favor social programs, there was shared agreement on fundamentals. Those fundamentals could be termed the New Laissez Faire. At the heart of the New Laissez Faire lay market-centered beliefs that date back to Adam Smith. It seems almost bizarre that in this era of complex computer models and sophisticated mathematical calculations that economists should propound an ideology that dates back to "the invisible hand" and the famous pin factory of The Wealth of Nations. When these economists communicate with one another, it's not in the language of common sense but in a jargon that has its roots in the work of 18th-century Scotsman Adam Smith. While in contrast, the right metaphors for the new economy are more Darwinian, with the fittest surviving, and, as modern Darwinians have come to understand, accidents of history casting long and consequential shadows. That a contemporary economist should use the Darwinian metaphor is even more troubling than evoking Adam Smith's "invisible hand." That the person who advocates such a perspective is crafting economic policy for Barack Obama is downright scary. Now as Geithner and Summers attempt to pull us out of an economic stall, they leave us with more questions than answers. It is to those questions we turn in Part Two. Creeping into some of the right wing attacks on Lawrence Summers is the unconscionable use of anti-Semitism. While this essay is critical of Summers, these attacks need to be stopped NOW! As someone whose uncle lost his family at Dachau, I urge all Americans to reject any hints of anti-Semitism in criticizing Lawrence Summers. I will not dignify these rants by citing them, but anyone who knows how to use a search engine can locate them if so inclined. Nowhere in this article does the author hold Obama responsible. That's like all the people who never held bush responsible for claiming that he had proof that OBL was responsible for nine eleven and would provide it to the American people. bush made OBL a Patsy and used the self-attacks as an excuse for what should have gotten him impeached. Obama seems to using the current state of the economy as an excuse to pay back his supporters in the financial services industry. Part of the problem with the whole country is saying "both parties." Sounds like we have no choice but those two. Both major parties do a lot of terrible things. They are in cahoots. That is why we need third party and independent candidates. That is why we need strong ballot access laws, that create competition for the two sets of hoodlums. I believe the author is simply wrong in placing so much emphasis on Gramm-Leach-Bliley. The statute the caused the true large scale problem was the Commodities 'Modernization' Act, sponsored by Phil Gramm in 2000. This statute made Credit Defaut Swaps non-regulated. It was the CDS market that ran amok. When you hear "toxic assets", think CDS. The euphemism is used to conceal the reality. The author's treatment of Geithner makes no sense to me. His quoted statements are innocuous. His job was dealing with other government's central banks, when he was at Treasury.